At the end of 2013, Maarten Manse, a student at Leiden University, and Hendrik E. Niemeijer, historian and project manager of the Corts Foundation, made a remarkable discovery based on their close reading of the Daily Journals of Batavia Castle in the VOC archives at ANRI. They discovered that these contain at least 4300 diplomatic letters in the 1683-1743 period alone. Half of them are incoming letters from Asian rulers. These letters (“Surat Emas” or “Golden Letters” in Malay diplomatic history) are all Dutch translations from the originals. This discovery resulted in a project plan for a database which would enable researchers and the general public to gain direct access to this unique collection. The plan also includes the publication of some letters to provide examples for the Indonesian and international public. 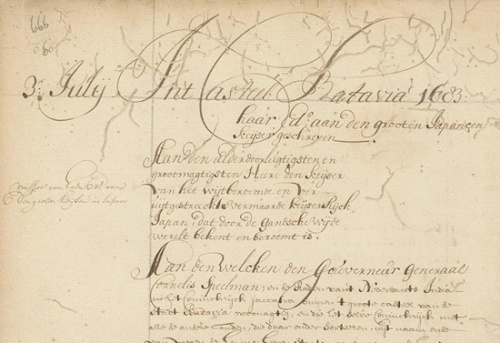 The letters were exchanged between hundreds of Asian kings, princes, regents and other dignitaries and the VOC's Supreme Government in Batavia Castle. One of the most remarkable “hidden collections” are the letters of the Kings and Phrakhlang (minister of external relations and finances) of the Kingdom of Siam (Post-1932, Thailand). The implementation of this digitization program will take place on this Sejarah Nusantara website with a searchable database of all identified letters, and a geographical visualization of the reconstructed document flow covering 200 different locations. A few of the most remarkable letters will be translated in English and Indonesian and published in the Harta Karun (Hidden Treasures) section of the website. The project will be realized in six months from July until December 2014. DutchCulture and the Dutch Embassy in Jakarta support this project and have assigned grants to help realize these objectives. Also Leiden University supports the project and provides student Simon Kemper to assist in the realization.